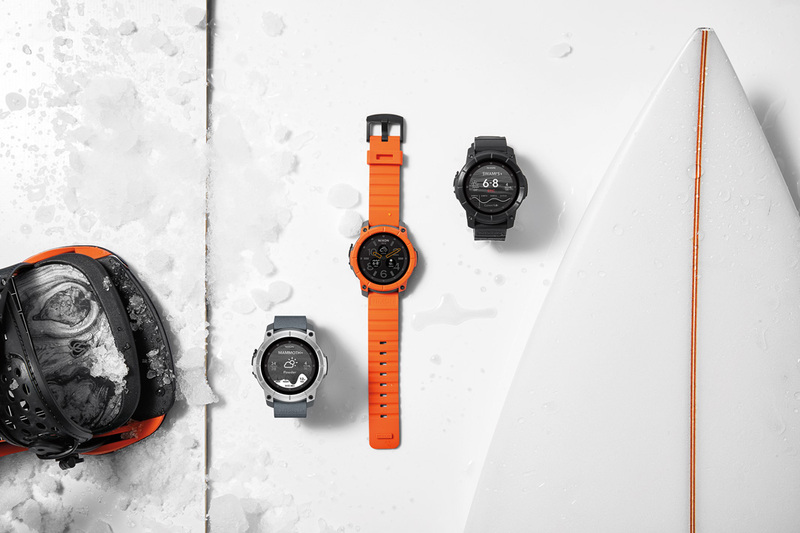 Hossegor, FR – California-based, watch and accessories brand Nixon announces The Mission — the world’s first ultra-rugged, action sports smartwatch. 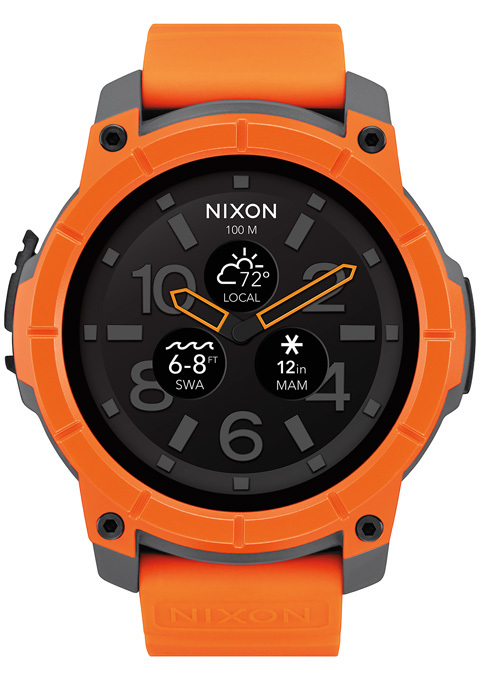 Built on the latest technology from Google’s Android Wear™ smartwatch platform and the Qualcomm® Snapdragon™ Wear 2100 system-on-chip (SoC), The Mission features a suite of custom applications tailored to action sports, as well as industry-leading durability and a category-first 10-ATM (100 meter) water-resistance rating. In addition to the full capabilities of the Android Wear™ platform and apps, the smartwatch introduces Nixon’s custom Mission app powered by Surfline and Snocountry. The Mission app places live conditions information at a glance of the wrist and features a custom activity-tracking application developed in partnership with Trace, the leader in action sports activity tracking. Pairing innovative software with an ultra-rugged and water-resistant design allows individuals to enjoy The Mission’s technology and third party apps where they are spending their time — riding, in the water, on the mountain, and beyond. Available later this year in multiple colors at select retailers, The Mission will also be available to customize on Nixon.com. Preloaded with the Nixon exclusive Mission and Trace apps, The Mission brings your world to your wrist. Powered in partnership by Surfline and Snocountry, The Mission app keeps surfers and riders updated in real-time on surf and snow conditions worldwide. The Nixon Trace app pairs with Trace and allows users to track their sessions and easily view their stats and session details during activity. The Mission features the toughest hardware of any smartwatch. With groundbreaking water resistant capabilities rated to 10-ATM (100 meters; 330 feet), The Mission has the highest waterproof rating of any smartwatch on the market. The Mission’s chassis is designed to take on the most intense situations. The custom-molded case is made from tough polycarbonate and stainless steel with a full round AMOLED display, all protected by the watch’s 316L grade stainless steel bezel that performs as a roll cage protecting the tough Corning® Gorilla® Glass crystal. A custom dual-layer, silicone band offers a balance between everyday comfort and off-road toughness. One of the first watches announced to be based on the Snapdragon Wear 2100 SoC, enabling sleek designs, long battery life, smart sensing, and always-connected experiences. The Mission will benefit from the chipset’s long battery life, smart sensing and always-connected experiences. Following its ethos of Team-Designed, Custom-Built, Nixon will offer customization options for The Mission through its Nixon.com e-commerce platform. Customers will be able to select between case finishes, custom bezel colors and a variety of band colors to create their own “1 of 1” special-edition model. Bezel options will include a variety of finishes such as solid stainless steel, IP plated steel and Cerakote™ pop colors. Bands will feature custom silicone colors in a durable dual-layer silicone band. Finally, the full-color digital display can also be set to mirror the face of Nixon’s leading watch models, including: The 51-30, The Sentry, The Player, The Ranger and The Unit.